Surfing Medicine – Don’t Eat the Fish! Scombroid, Ciguatera, Fugu, Amnestic Shellfish Poisoning. Weird names for weird diseases all caused by eating seafood. Most surfers are aware that these diseases exist, but unless you are a toxicologist, it is likely that you are somewhat hazy about the exact causes, symptoms, and treatments of these interesting maladies. Given the strange and often overlapping symptoms, and the fact that some of these illnesses are regional, your ignorance is forgiven. However, if you travel to surf, take care of travelling surfers, or just like to eat fish, chances are very good that you will, from time to time, encounter at least one these seafood poisonings. Lets start with the most common seafood poisoning in the US, scombroid, which is the result of inadequate refrigeration of fish from the Scombridae family. When these pelagic fish begin to spoil, the amino-acid histidine, contained in high levels in their flesh, is metabolized by bacteria into histamine. Not surprisingly, histamine, when ingested from the tainted fish causes symptoms that mimic an allergic reaction. The most commonly implicated species of fish in the scobridae family are Tuna, Wahoo and Mackerel, though non-scobroid fish open-ocean fish such as Mahi-mahi (aka Dorado) and swordfish can also cause the illness [see box for a more complete list]. It is important to note that fish, once caught, may have travelled thousands of miles and may have passed through many hands before they reach your dinner plate. For example, the tuna steak sandwich you order in San Blas, Mexico, may have been caught off the coast of Massachusetts, processed in Miami, and sold to a whole sale restaurant distributor in Puerto Vallarta. If anywhere along that journey the fish was allowed to reach a temperature above 4.5o C (40o F) the fish may begin to decay and resulting in high levels of histamine in its flesh. Though bacteria are killed by cooking, the toxin, once formed, is heat stable and unaffected by cooking, smoking, or freezing. Because the toxin may be unevenly distributed within a given fish, some individuals eating the same fish may be more affected than others. In a typical case, an individual will develop facial flushing, nausea, diarrhea, palpitations and a headache which develop within 20 – 60 minutes of eating fish. A confluent rash involving the upper chest, neck and face is nearly universal. Some patients describe the rash as itchy, but most do not. When questioned, patients may recall that the fish had a peppery, bubbly or metallic taste. 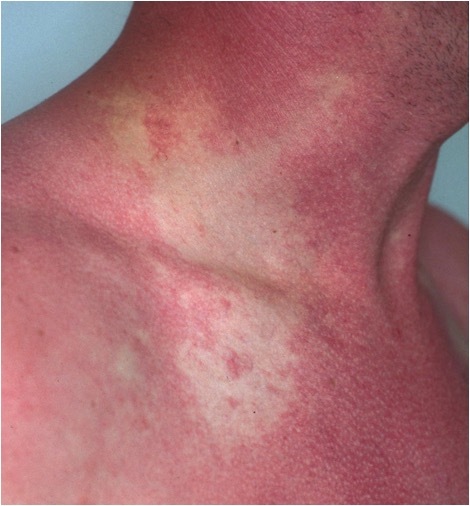 Besides the distinctive rash, (SEE FIGURE) patients are usually tachycardic and ill-appearing. Wheezing may be heard, particularly in asthmatic patients or those with COPD. Hypotension due to hypovolemia and vasodilatation has been described but is uncommon. Though the symptoms are unpleasant, they are self-limited and generally resolve with-in 12 hours, even without treatment. Scombroid Rash: Note location on the upper chest, face and neck. It is confluent and not raised. Antihistamines such as diphenhydramine (Benadryl), or loratidine (Claritin), either orally or IV are highly effective, and rapidly improve symptoms. Zofran and IV fluids are helpful to treat nausea and dehydration. Asthmatics or those with COPD may require inhaled beta-agonists such as nebulized albuterol. Because Histamine is ingested and not produced through endogenous degranulation of mast cells, steroids are of no benefit. Likewise, affected individuals should not be told that they have a seafood allergy. Ciguatera fish poisoning (CFP), caused by the ingestion of reef-fish tainted with a naturally-occurring toxin, is the most common fish poisoning world-wide with an incidence as high as 100/10,000 people on some tropical islands. This fascinating disease is characterized not only by gastrointestinal symptoms, but by neurologic and cardiac symptoms as well. Ciguatoxin, the causative agent of the disease, is produced by gamberdiscus toxicus a unicellular plankton which often makes its home on the surface of algae growing on damaged coral reef. This type of plankton is in the phylum dinoflagellata, whose members include the causative agents of so called “red tides”. But more on that later. The toxin is introduced into the food chain when small herbivorous fish peck on the surface of coral reefs ingesting the toxic plankton. 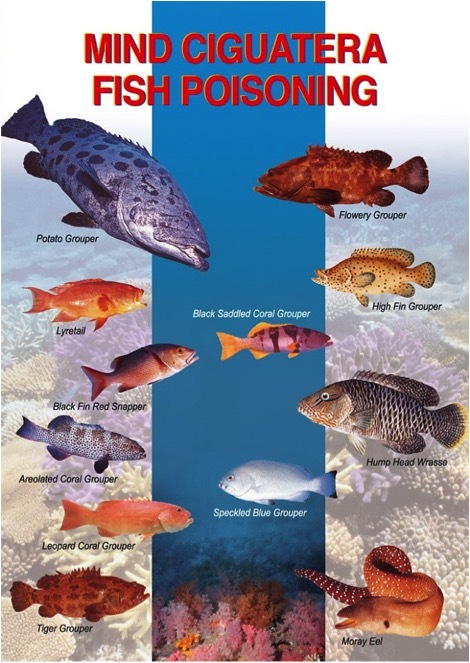 Those smaller fish are then gobbled up by larger carnivorous fish (SEE Ciguatera LIST) such as grouper or snapper which in turn bio-accumulate the toxin. Humans then eat these fish and develop CFP. 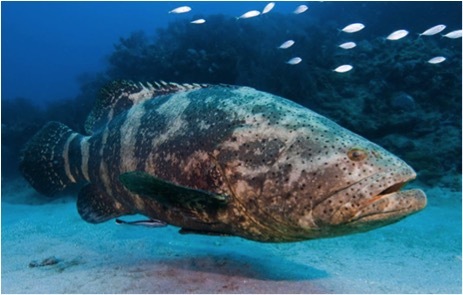 In endemic areas, the larger and older the fish, the higher the concentration of toxin. As a general precaution, many experts recommend avoiding the consumption of fish bigger than a dinner plate caught in unfamiliar reefy waters. Partial list of fish known to cause Ciguatera Fish Poisoning. Ciguatoxin has no effect whatsoever on the health, appearance, or taste of the fish, so without sophisticated testing, contaminated fish cannot be identified before eating. Savvy mariners of yesteryear used an old-fashioned technique called a cat-scan to see if a fish was safe to eat. That is, they would remove the fish’s liver and feed it to a cat. If the cat died, the fish was deemed unsafe for human consumption. Like scombroid, the toxin is heat-stable, and therefore unaffected by cooking, smoking or freezing. This disease is highly regional, and as with many other aspects of surfing, local knowledge is key. For example, fish caught on the north end of an island may be perfectly safe to eat, whereas those caught on the south side of the same island, where the reef has been damaged by dredging, runoff, or a hurricane may contain high levels of ciguatoxin. Ciguatera is most prevalent in the Caribbean and French Polynesia, though it can be found in tropical surf-spots worldwide. Hawaii and Florida are the only states in the US where occasional outbreaks from local fish have been reported. Early in the illness, gastrointestinal symptoms predominate. However, compared to scombroid, the onset of symptoms is delayed, with diarrhea and vomiting presenting 6-12 hours after ingestion, and usually resolving within 24 hours. The characteristic features of CFP, however are neurologic symptoms, which may not begin until a day after ingestion, and often persist for weeks. Cold allodynia, a condition in which cold objects feel hot, while not universal, is the perhaps the most distinguishing symptom, but other bizarre symptoms are common. Paresthesias of the perioral region and extremities are extremely common, while pruritus, headache, dizziness and the sensation of loose teeth are more variable. More severe central nervous symptoms such as ataxia, fasciculations, seizures and coma have also been reported. In the Caribbean neurologic effects mostly occur after GI symptoms have resolved, whereas in the Pacific, neurologic symptoms appear more quickly and are often more severe. Bradycardia and hypotension, early in the disease process may also be seen in severe cases. Musculoskeletal symptoms such as severe back pain and arthralgias are also common. A weird disease indeed! The common denominator unifying all of these seemingly unrelated ailments is the fact that ciguatoxins (there are 5 congeners) are potent neurotoxins. Ciguatoxins have been shown to bind to voltage-gated sodium channels. At the resting membrane potential of axons, sodium channels are closed. CTX molecules induce the opening of these channels at resting membrane potential. This leads to an influx of sodium, a process that depolarizes the axonal membrane and triggers spontaneous and repetitive action potentials, sending a buzz of constant sensory impulses back to the brain. Lidocaine, used intradermally for anesthesia, blocks those same voltage-gated sodium channels, allowing your dentist to painlessly extract a tooth. Think of ciguatoxin as the anti-lidocaine. Treatment is supportive and there is no clinically proven antidote. Antiemetics such as ondasteron (Zofran) of promethazine (Phenergan) can be used for vomiting. IV fluids and pressors have been successfully used to treat hypotension, and bradycardia is responsive to Atropine. A number of other remedies have been advocated, most notably Mannitol and Nifedipine, but neither seem to be more effective in reducing symptoms than placebo. In general, all symptoms resolve within weeks, however occasionally they can last for months. To make a strange story even stranger long after the illness has resolved, ingestion of nuts, alcohol, and untainted fish can cause recurrence of paresthesias. Paralytic Shellfish Poisoning (PSP), caused by the ingestion of shellfish contaminated by the potent neurotoxin, saxitoxin, is a potentially fatal disease, with fatality rates as high as 10%. Saxitoxin also acts on our new-found friend the voltage-gated sodium channel, in this case locking it closed, preventing nerve conduction, and also preventing muscular contraction. As the name implies, in severe cases, it results in muscular paralysis, respiratory depression and death. Symptoms often occur rapidly, within 30 minutes of ingestion. Nausea, vomiting, diarrhea and peri-oral tingling are early symptoms of disease. The GI symptoms are short lived, and tend to be relatively minor in nature. Paresthesias to the lips may later spread to the neck and chest. In severe cases, numbness and tingling involves arms and legs and the victim develops muscular weakness, diplopia, dysarthria and ataxia. Severe weakness may lead to respiratory depression and death if no ventilator support is provided. Symptoms peak at 12 hours and begin to subside over the next 24 hours, with complete neurologic recovery the rule in survivors. In an outbreak in Guatemala affecting 187 people who had eaten tainted clams, the fatality rate was 50% in children less than 6 years of age and 7% in those over 18. Amnestic shellfish poisoning is caused by the bioaccumulation of domoic acid produced by the phytoplankton, pseudo-nitzschia. These harmful algae (SEE MAP) When accumulated in high concentrations in clams or crabs, this toxin affect not only humans, but also can result in illness and death of seabirds in marine mammals. Mussels, butter clams and Dungeness crabs are the most commonly identified culprits in the US. Symptoms of nausea, vomiting, diarrhea, and abdominal cramps generally occur in the first 24 hours after ingestion. In more severe cases neurologic symptoms occur 1-3 days post consumption of tainted seafood. These include head ache, dizziness, and short-term memory loss. Unlike PSP, the vast majority of affected individuals have an uneventful recovery. In the elderly and those with renal impairment, memory loss may be profound, and permanent. In a 1980’s outbreak attributed to mussels on Price Edward Island, Canada, of 107 victims, 4 died and a handful of mostly elderly people developed permanent memory impairment. Historically, PSP, and ASP were known to indigenous peoples. Native Amercians would not harvest clams or mussels if they noted bioluminescence (associated with algal blooms) in coastal waters. Jewish tradition forbids the consumption of seafood “without scales” due to their recognized dangers. However due to a lack of understanding as to the causes of these diseases, preventive efforts were not entirely successful. A large-scale outbreak in San Francisco in 1927 resulting in a handful of deaths put an end to this. Researchers soon found the link to toxic algae, and isolated the causative toxins. Departments of health in the US, Europe, Australia and New Zealand now routinely monitor shellfish beds for the presence of high levels of saxitoxin and demoic acid. The test is simple; grind up a bunch of mussels, purify the extract, and inject it into the peritoneal cavity of a mouse. If the mouse lives, the mussel bed remains open, and if it dies, the mussel beds are closed. Due to the seasonal nature of algal blooms in certain regions, harvest of mussels and clams may be prohibited during summer months. As a result, most poisonings now occur solely among recreational harvesters who are not aware of local shellfish bed closures, often marked by postings on the beach. Those suspected of having contracted PSP or ASP should be immediately brought to a hospital where ventilator support will be available. No antidotes exist, and treatment is purely supportive. Fluids and antiemetics are often administered for those who are vomiting and volume depleted. Seizures are uncommon, but respond to Diazepam (Valium). Ventilatory support should be anticipated, and in the case of PSP, a full neurology recovery is the norm of the effects of the toxin have passed in 1-3 days. “What the fugu u lookin at?” A full discussion of fugu or blowfish poisoning will appear in a subsequent issue of Surfing Medicine. For those who can’t wait, here is a bit of a primer in this hilarious segment of The Simpsons entitled One Fish Two Fish Blowfish Blue Fish.